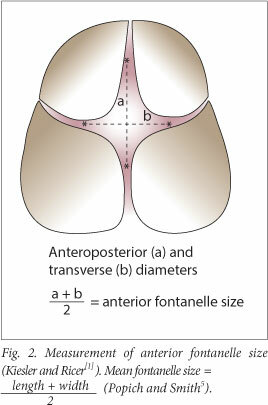 BACKGROUND: Several factors, including gestational age (GA), gender, race and geographical/regional area, contribute to variations in the size of the anterior fontanelle (AF). While the impact of GA and gender are clearly established, the influences of region and ethnicity vary in the published literature. OBJECTIVES: To assess AF sizes in normal newborn Igbo babies in south-eastern Nigeria, establish baseline values for our population, and evaluate the relationship of our findings to some factors reported to affect AF size. METHODS: AF size was measured in 269 healthy term newborn babies using the method proposed by Popich and Smith and modified by Faix. Measurements were taken 24 - 48 hours after birth. RESULTS: The mean AF size was 2.97 cm (± standard deviation (SD) 0.71, range 2.0 - 4.8). 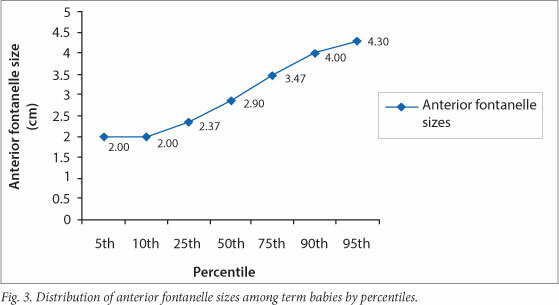 Female babies had slightly larger anterior fontanelles than males (2.98±0.75 cm v. 2.97±0.67 cm, respectively), although this was not statistically significant (p>0.05). 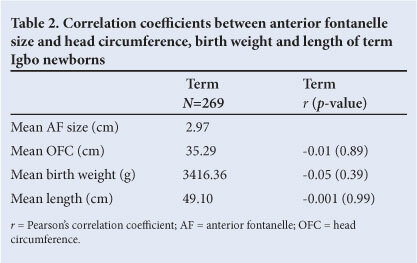 Size of the AF had no significant correlation with head circumference (Pearson correlation coefficient r=-0.01; p=0.89), birth weight (r=-0.05; p=0.39) or length (r=-0.00; p=0.99) of these term babies. Neither GA nor mode of delivery influenced AF size (p>0.05). The mean anteroposterior dimension of the AF (3.22±0.82 cm) was significantly longer than the mean transverse dimension (2.71±0.65 cm) (p<0.01). CONCLUSIONS: At term, AF size has no relationship to GA or such growth parameters as head circumference, birth weight and length. The mean AF size of 2.97±0.71 cm obtained in this study is recommended for use in assessing term Igbo newborns. The fontanelles are fibrous, membrane-covered gaps where more than two cranial bones are juxtaposed. A newborn baby has six fontanelles: the anterior and posterior, two mastoid and two sphenoid. Of the six fontanelles, the anterior fontanelle (AF) is the most prominent and the most variable in size. 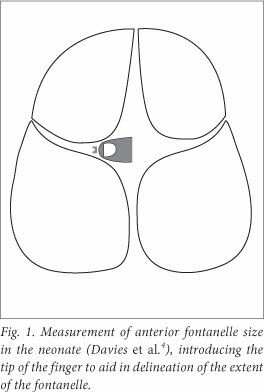 Size of the AF has been utilised as evidence of altered intracranial pressure and as an index of the rate of development and ossification of the calvarium. It may be altered in a wide variety of disorders affecting morphogenesis. Several factors are thought to contribute to the variability of the anatomy of the AF. The principal factors recognised as influencing AF size are gestational age (GA),[3,4] gender,[5-8] race[9-11] and genetics. Brain growth, dural attachments, suture development and osteogenesis have all been reported to influence fontanelle development. Even within a given country, geographical or regional differences in fontanelle sizes have been reported. [10,13] An Israeli report, however, noted no difference between children of diverse ethnic origins in their study population. Since AF size appears to show racial and perhaps regional variation, it is necessary to have reference standards for specific populations to ensure proper interpretation. Two studies, mainly from the western part of Nigeria (predominantly Yorubas), documented normal fontanelle size among newborns. Further studies from parts of the country other than the west need to be conducted to ensure proper representation of the Nigerian newborn population. This study assessed variations in AF size in newborn Igbo babies in south-eastern Nigeria, with the aim of establishing baseline values and relating the findings to some factors reported to affect fontanelle size. The study was carried out at the University of Nigeria Teaching Hospital (UNTH), Enugu, in Enugu state. Enugu state, one of the states in the south-eastern part of Nigeria, is inhabited mainly by the Igbo ethnic group. UNTH is the main tertiary health institution in Enugu state and provides tertiary health services in all specialties of medicine including obstetrics and paediatrics. After delivery, clinically stable newborn babies are examined and spend 48 hours in the postnatal ward for routine observation before discharge. A total of 269 full-term (37 completed weeks through 41 weeks), appropriately grown neonates delivered at UNTH between November 2007 and June 2008 were enrolled into the study. Eligible subjects were normal newborn Igbo babies undergoing routine observation in the lying-in ward and babies in the Newborn Special Care Unit (NBSCU) with no apparent neurological, skeletal or congenital problems at the time of the study. Babies with neurological problems (e.g. severe birth asphyxia, congenital neurological defects), obvious chromosomal abnormalities, caput succedaneum, cephalhaematoma, neonatal meningitis or cranial haemorrhage, and babies delivered outside UNTH but later admitted to the NBSCU, were excluded from the study. Ethical approval for the study was obtained from the UNTH Ethics and Research Committee. Informed consent was obtained from the mother or from both parents before the baby was enrolled into the study. Two hundred and sixty-nine normal term newborn babies who met the inclusion criteria were recruited into the study. This was done by consecutive enrolment of all births. Measurements were done between 24 and 48 hours after birth to allow time for the head to regain its normal shape after the skull moulding that occurs in the course of delivery, as has been suggested by other workers. [6,14] The subjects' GAs were estimated using the method of Ballard. An infant was considered appropriate for GA if his or her birth weight was between the 10th and 90th percentile using the Lubchenco chart. The AF was examined when the neonate was calm and held in the upright position by an assistant. Popich and Smith's method of calculating fontanelle size, as modified by Faix, was adopted for the study. The index finger was introduced in turn into each of the four corners of the baby's AF. Then a small dot was made with washable ink on the scalp immediately distal to the fingertip, using a felt-tip pen as proposed by Davies et al. (Fig. 1). The anteroposterior (AP) and transverse diameters of the AF were measured with a steel tape and recorded to the closest millimetre. The size of the fontanelle was then calculated as a mean sum of these diameters (Fig. 2). The head circumference of each baby was measured with non-stretchable tape and the length of each with an infantometer. Birth weights and modes ofdelivery were obtained from patient folders. All measurements were recorded in the proforma designed for the study. Data entry and analysis was done using the Statistical Package for Social Sciences (SPSS), version 11.5. Proportions were tested using the chi-square test, while means were compared using Student's t-test. Pearson's correlation test was used for determination of correlation coefficients between parameters. A p-value of <0.05 was considered statistically significant. Of the 269 babies, 143 (53.2%) were males and 126 (46.8%) females (male/female ratio 1.1:1.0). The babies were further divided into those with a GA of 37 - 39 weeks (141) and those with a GA of 40 - 42 weeks (128). There were 178 vaginal deliveries (66.2%) and 91 caesarean sections (33.8%). The mean AF size for the study population was 2.97 cm (± standard deviation (SD) 0.71, range 2.0 - 4.8). The distribution of AF sizes is set out in Table 1. About half (50.2%) of the infants had AF sizes between 2.0 cm and 2.9 cm and the other half sizes of 3.0 cm or more. In the latter group, only 30 (11.2% of the total) had an AF size of 4.0 cm or more. None of the infants had an AF size less than 2.0 cm. The percentile values of the AF sizes are shown in Fig. 3. Comparison of the mean AF size of babies born between 37 and 39 weeks' GA (2.97±0.63 cm) and those born between 40 and 42 weeks (2.97±0.79 cm) showed no significant difference (t=0.028; p=0.978). The male and female neonates had comparable AF sizes of 2.97±0.67 and 2.98±0.75 cm, respectively, with no significant difference (t=-0.14; p=0.89; 95% confidence interval -0.18 - 0.16). Similarly, there was no statistically significant difference between the AF sizes of babies delivered by caesarean section and those delivered vaginally (t=1.124; p=0.262). The relationship between mean AF size and mean values of growth parameters (head circumference, weight and length) is shown in Table 2. We observed a significant difference between the mean AF length/AP dimension (3.22±0.82 cm) and the mean AF width/transverse dimension (2.71±0.65 cm), with the length being longer (t=19.09; p<0.05). The mean AF size of 2.97±0.71 cm in this study is close to the 3.08±0.80 cm reported by Faix for black American neonates but higher than various values recorded for Caucasians, although still consistent with documented findings that black neonates have larger AF size than their Caucasian and Oriental counterparts. [5,6,9,11] The basis for this racial difference is unclear. [7,11] Although it has been established that small-for-gestational-age neonates have larger fontanelles because of delay in osseous maturation of the skull bones, as do neonates with skeletal morphogenesis,[4,11] none of the studies cited above included such subjects. It is possible that some sort of delayed osseous maturation is a normal variant in black neonates. The mean AF size of 2.97±0.71 cm for term newborns in our study is smaller than the 4.0±1.0 cm and 3.3±2.0 cm reported by Adeyemo et al. and Ogunye et al., respectively, in Nigerian neonates. The reason for this is not clear, but it may be related to differences in methodology, especially in the presence of wide sutures. According to Tan, wide sutures have been associated with large fontanelle size in the presence of normal head circumference in completely normal healthy neonates. In our study, the extent of the AF dimensions were delineated using acceptable methods as documented by Faix and Davies et al., whereas the delineation of the extent of the boundaries was not clearly stated in the previous Nigerian studies. This difference in AF sizes between our study and the previous Nigerian studies may also be due to genetic or regional variation,[10,13] as some workers have suggested. The roles of various factors that might explain these differences may need to be reviewed. No term baby in the present study had an AF size of less than 2.0 cm. This differs from the two previous Nigerian studies, in which a few subjects had AF sizes of less than 2 cm[11,17] and even less than 1.0 cm. This could be related to timing of measurements; both studies[11,17] took some of their measurements less than 24 hours after birth, so the effect of skull moulding may have influenced their findings. There was no statistically significant difference between the AF sizes of the two GA groups of term babies in this study, a finding similar to the study by Adeyemo and colleagues and indicating that a GA of at least 37 completed weeks is a good cut-off point for considering a baby term. AF size showed no significant correlation with head circumference in the babies studied, a finding similar to those of others. [6,11,17,18] The lack of a significant relationship between AF size and birth weight is consistent with previous Nigerian studies. [11,17] Similarly, we found no relationship between AF size and length of the babies. These findings perhaps suggest that at term, AF size is not related to commonly used growth parameters such as birth weight, head circumference and body length. No statistically significant gender difference was observed in this study. This is in accord with previous Nigerian,[11,17] Caucasian[4,5] and Oriental studies, but at variance with the findings of Mir and Weislaw, who found a significant gender difference in Arab neonates. There was no significant association between the two modes of delivery and AF size, which is in agreement with a study done in Brazil. Finally, a significant difference between the mean length and mean width of the AF, with the length being longer, was observed in this study, a finding that contrasts with those of Popich and Smith and Ogunye et al., who found no significant difference in these measurements. Although the reason for this disparity is not clear, the fact that the AF varies widely, not only in size but also in shape,[1,4,5] could offer a possible explanation. A simple method for measuring the size of the AF at birth is described. The study also provides the normal range of AF size in term Igbo newborns, which can serve as reference values for clinical use. At term AF size showed no significant relationship to GA, gender or growth parameters such as head circumference, birth weight and length of the baby. Even in a specific country, geographical or regional variations in AF size can occur. It is therefore important to use local values as reference in order to avoid errors in interpretation. Authorship. All persons listed as authors participated in the conception, design, analysis and writing of this article. All authors gave their final approval of the version to be published.